The Chase Factory Team riders Connor Fields and Joris Daudet, were joined by supported riders Melinda McLeod, Sifiso Nhalpo, Jamie Staff, and Renato Rezende made the trip to Rock Hill, South Carolina for the USA BMX Gold Cup Finals East event, which was a pro series, and the first USA BMX Supercross event. The Rock Hill facility is state of the art for BMX racing, with both the 8 meter and 5 meter starting hills, and an incredible track built by Elite tracks. The city of Rock Hill had pulled out all the stops to have the premier BMX track in the USA and looking back to all that was built in South Carolina, they have exceeded the expectations of many and have done a great job of brining the sport of Supercross BMX to the spotlight is so much deserves. If you are anywhere near this facility, we suggest you go and see if for yourself! More info on Rock Hill can be found here. The only thing the City of Rock Hill could not control was the weather. Friday was just perfect, but as the races kicked off on Saturday the rains were headed in the direction of the track and they would hit, just as the main events were to start. With the Elite riders taking to a 8 meter high starting hill and the large jumps on the track, the Main events for the Elite Men and Women were postponed until Sunday morning, so the conditions would be safer for the riders. The Elite Mens class was stacked with the start of BMX and Connor Fields has a firm hold in that group of riders. Connor had a great weekend with making the main event both days finishing 3rd on Day #1 and 4th in Day #2. 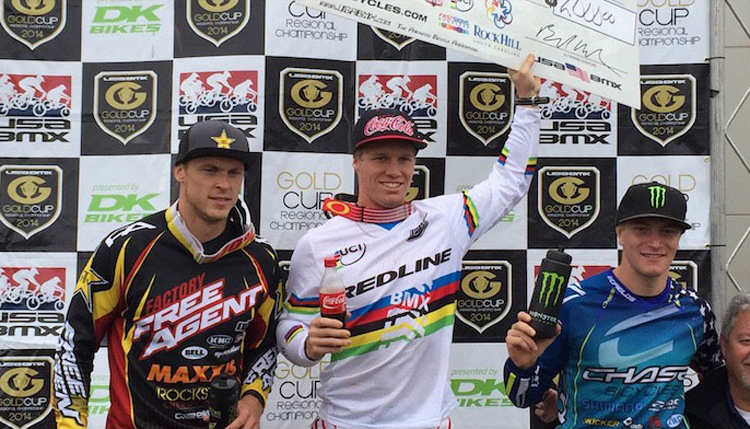 Connor rode consistent and strong and now sits 3rd overall in the USA BMX overall rankings. Joris Daudet was looking good both days, but he was only able to advance onto the semis both days. 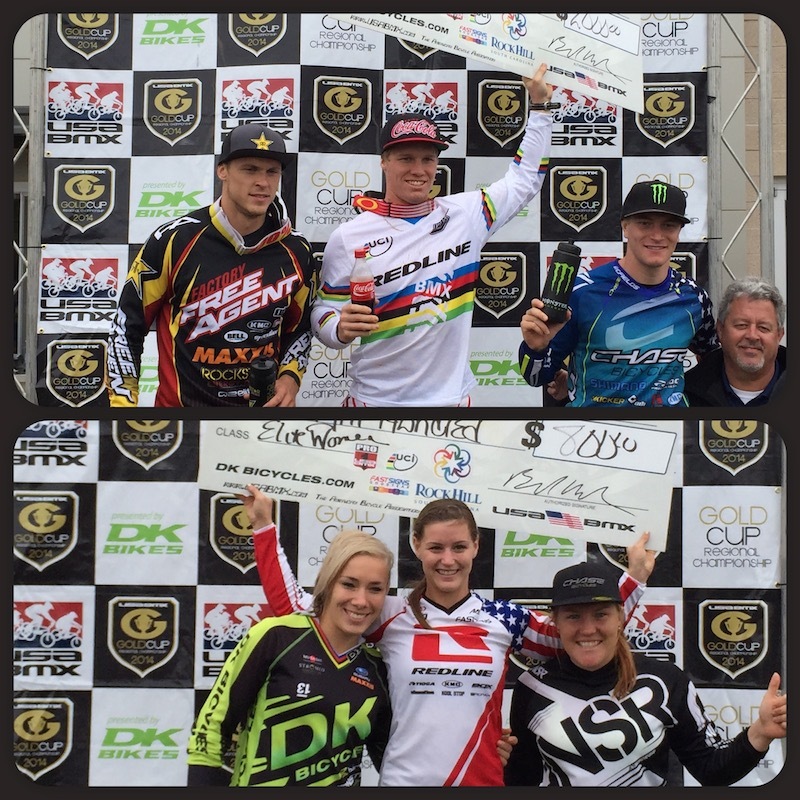 Melinda McLeod stuck around the USA after the UCI BMX World Cup finals to race her first weekend ever of the USA BMX Pro Series tour and with 2 3rd place finishes in Rock Hill, she continued on her podium performances she has been solidly be putting in this 2014 BMX season. Jamie Staff was on hand at the Rock Hill facility to not only support the USA Cycling riders and help further promote the USAC Jr Development program, but he also put some time on the track. Jamie was 2nd both days in the Vet Pro class and this now throws him into the overall title hunt for the 2014 season. Not too bad for a part time BMX racer. The team now has a weekend off before heading to Orlando, Florida for the last weekend of the regular USA BMX Pro series tour, for the Disney Cup. We are excited to be joined with the DHR team in Florida for one of the best weekends of BMX racing all year long!